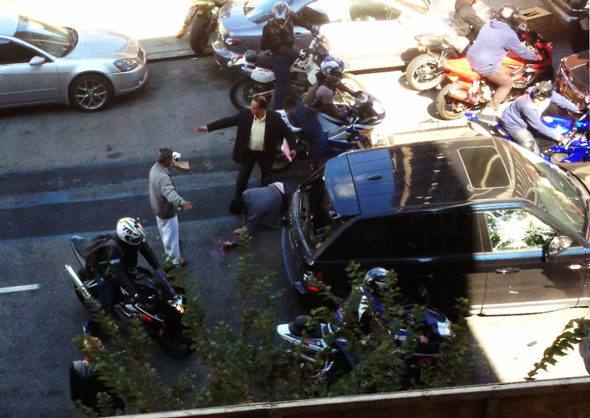 Sharing the road with bikers – How do we avoid the rage? Everyone knows about road rage. It has been featured on TV shows, in movies, and even in video games, but what’s really the psychology behind the road rage phenomenon and what causes road rage and aggressive driving among bikers and other road users? Do you believe that road users in general are courteous enough to other different modes of transport? I think you said it in your question, "courteous enough" with emphasis on "enough". If road users were courteous enough, we would see a huge drop in multi-vehicle accidents on our roads today. So my answer to this is a most definite NO. All road users are occupied with some sort of distraction factor like personal circumstances, social and work related pressure that results in a display of attitude towards other people/road users irrespective the mode of transport. Through these distractions most of us are so absorbed, dare I say self-absorbed, and when anything or anyone dares to enter into our little bubble of comfort we explode or react in an inconsiderate manner. We have a lot of work in this area, a long road ahead indeed. Would it be true to say that traffic congestion adds to the frustration that motorists might have towards bikers passing them by? It is known fact, well to some at least, that traffic congestion plays a huge role in road user behaviour and attitude display. Strangely those who display an attitude of envy or jealousy when others pass them in life or business achievements, etc. are the first to react or become upset when a motorcyclist pass them by while they are stuck in traffic and left behind; a strange analogy but true. It takes discipline and a lot of self-control to not become frustrated with traffic congestion, and then when another simpler mode of transport passes by – leaving the loud pipes out of this for now, just adds to the excitement factor for those who lack these qualities. What other factors do you believe could contribute to this animosity and frustrations? Which types of riding behaviour do you believe non-bikers might find agitating? What are the typical responses from agitated road users that could threaten the safety of our bikers/motorcyclists? Well first any reaction from another road user using his/her vehicle to threaten and inflict any harm to another road user, irrespective of the mode of transport, is a criminal offense. Road users in cars, trucks, etc. need to realise how vulnerable motorcyclists are on the road, and how quick any response on their part can affect the safety of not just the motorcyclist, but of other road users as well. No matter how justified it might feel at the time; don’t even think about it, that is a person not a machine! With rising fuel prices we find many more bikers on the roads – would you say that experienced bikers are better equipped at sharing the roads safely with other modes of transport and why would you say so? In a way yes, but what defines an experienced rider: A rider who has done a number of rider training courses in the last 5 years and been riding in the current traffic climate, or a rider who has been riding for many years but more accustomed to the traffic climate of the 80s and 90s? I personally define an experienced rider by his or her ability to avoid an accident, deal with all sorts of traffic or riding conditions our roads could throw it them, and successfully completed a number of rider training courses up and beyond advanced level. In this case they are better skilled to read and react, also more focussed and ride with a more disciplined attitude. For this reason this type of rider is a safer and a better “road sharing” rider. Young rider, the more mature or older rider; the attitude toward others determines the outcome, experience then follows. What recommendations would you offer to bikers/motorcyclists to avoid becoming the cause of aggressive driving behaviour? Most of all, we need to stay calm and stay focussed, any aggressive behaviour on your part can and will only cost you. The question is: Can you afford it? 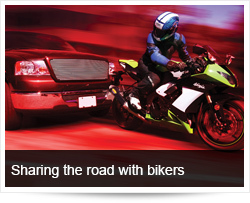 What do you recommend to bikers in the event that they may be confronted by other road users! The following might sound crazy, but it works for me. It calms me down, I don’t have a headache afterwards and I get to my destination safely, period! Immediately make funny noises, or if you prefer, burst out laughing or singing in a loud voice, this causes a distraction from feelings of fury or anger. Start talking to yourself, give yourself all the rational reasons for not doing anything, and to just forget the situation counting yourself lucky. Convince yourself you are more of a human being if you forgive, forget, and live to ride another day without a stop-over at the hospital or police station. Can driver and biker education/sharing information contribute to less frustration? Proper education from a young age can help alleviate the problem. It means starting driver education as toddlers, when they ride in the back seat, all the way through to young adults when walking in parking lots, sidewalks and streets. Avoidance techniques and proper education should work to help most road users avoid road rage, but I am convinced that as long as there are road users, there will always be people who let their emotions get the better of them, which can be a real danger to others. Aggressive road use by one user is dangerous to hundreds of others, so if half of them are aggressive, our roads become killing fields. We are planning to host a Motorcycle Safety Convention in the near future; it might be a good idea to have members of both parties involved. What would be the most important info/thoughts Bike Talk would like to leave in the minds of both riders/ drivers to ensure enhanced harmony in sharing our roads? We can try, but in the end it is for the person reading this to decide if he/she wants to “Control Yourself” and start the process of change. Fact: You can spot an aggressive driver by the way he/she weaves in and out of traffic, drive too fast on crowded highways, tailgate, scream at you or use obscene gestures. They are a new kind of road hazard. 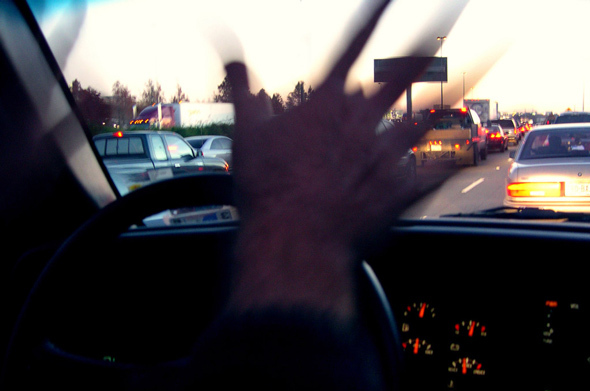 Let's face it, at one time or another every one of us has been angry while driving/riding. In today's hectic, fast-paced world, it's easy to become frustrated, and increasingly people express their anger when driving. Avoid the consequences of road rage by at least trying following these guidelines shared in this article. Speed causes nearly one-third of all fatal motor vehicle crashes. Speeding reduces the time a road user has to avoid a crash or a dangerous situation and greatly increases the likelihood the crash will be severe. Slow down! Don't bother trying to pass, only pass when you know you can. If you think you are a good driver, then you must drive a lot. If you drive a lot, remind yourself odds are against you for avoiding an accident. Pay attention! Indicators and mirrors are tools. Don't use them because it's the law or to ask to execute a manoeuvre; use them to your advantage. If you tailgate, I know you don’t know how to drive because you are assuming the other road user is as good as you. Do what you want, but don't do it to me. 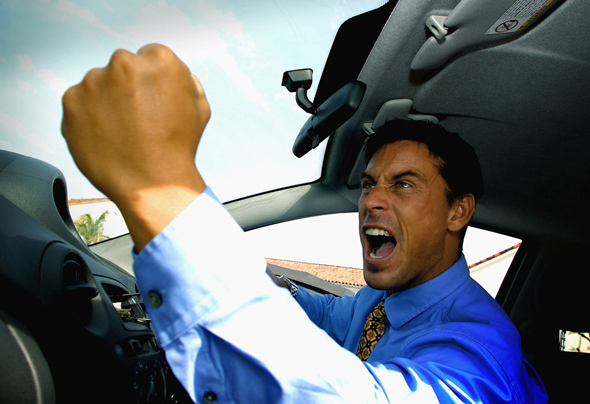 Aggressive driving is a traffic offense; road rage is a criminal offense!